The Historic Centre of the City of Arequipa is one of the most interesting examples of Latin American architecture and town planning. Frequent earthquakes, the abundant presence of volcanic rock, known as silla, and the city’s geographical isolation lead to the development of a distinct local architecture. It is characterized by the robustness of its walls, extensive use of archways and vaults, Romanic courtyards and open spaces and baroque decoration of the facades. The artistic designs show the integration of European and native characteristics, resulting in some of the best mestizo Baroque buildings in the world. Most of them originated in the 16th century, but were built over and over again in the 17th and 18th centuries after several earthquakes struck. Furthermore, the city has a spectacular natural setting in the foothills of three snow-capped volcanoes. 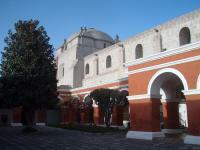 I did my round along Arequipa´s churches and convent on an early Sunday morning. It was mother´s day as well, so most of the churches were open for services and generally packed. People walked in and out, so it was not difficult for me to get in as well. La Compania was my first stop, and this one already has the sculptured façade that Arequipa is known for. The rest of the construction is quite bland and bulky, which makes the decorations at the front really stand out. This church also has a façade at the side, with a fine sculpture of a knight (St. James) and two mermaids. At San Francisco church I first clearly saw the enormous vaults that support so many of the buildings here in Arequipa – to survive another earthquake that will come sooner or later. Via the small La Merced and the 18th century San Agustin, I arrived at the Santo Domingo church where the wooden altar stands out. The convent of Santa Catalina is the highlight of the city, and could have earned WH status on its own merits alone. A tour will take you along the different parts of the convent, which walls are painted red, blue and yellow to soften the reflection of the sun on the naturally white silla. This colouring I think is one of the reasons tourists enjoy it so much, it is very picturesque. But the convent's history is fascinating too: the nuns here were really locked away from the rest of the world, but lived in comfort and died at an average age of 80 years. They spent their days on embroidery and prayer, but were not taught to read and write until the 19th century. The day after, I was finally lucky to get into the Cathedral. I had tried several times on Sunday, but it was mostly either closed or a service was going on (and then tourists are not allowed to enter). It took awhile to get used to the Cathedral's interior: it is so much more "new" than the other churches here. But then its neoclassical features started to become clear. The statues of catholic saints resemble those of Greek philosophers. 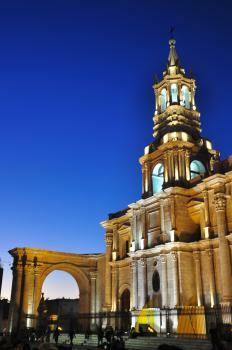 In all, Arequipa is a very pleasant city to stay in. Besides the historical city center, the Mansion del Fundador (8kms away) and the museum where the frozen Inca girl Juanita is shown are also well worth visiting. The city in general isn't as "white" as its nickname would suggest. Only part of the buildings in the city center are off-white (or grey, due to pollution). Lots of them are yellow, red or blue however. The guide at the Santa Catalina convent told us that "White City" referred to the original population type of the city consisting of white Spaniards, not to the colour of its constructions. When my plane descended to Arequipa Airport, I wondered how on earth people settled in this hostile environment in the middle of very dry terrain next to volcano, and questioned that Arequipa will be a good destination or not. However, when I approached the city area, I found that the city is quite green and prosperous than I expected. The taxi took me to the hotel in the center of historical area. Almost every building is built by white stone which was quite amazing to see how harmonious the color the city is. After check-in the hotel interior is brightly painted with red, yellow and blue and the courtyard is lushly bright green and full with blooming flower. I really impressed what I have seen and praised to hotel receptionist, but she said such interior can be found almost every building in the old city which later I discovered her words did not exaggerate at all. Similar to other tourists, Santa Catalina Monastery was my first place to visit and indeed the monastery was really charming for its lovely gardens and breathtaking color walls with brightly red, yellow and blue similar to the hotel I stayed. The monastery is really interesting for its role for woman in old time, it was actually quite a privilege to be in the monastery and huge support money from family was a must. I was a bit surprised to discovered that even in the past, money is needed to buy simple life! The complex is really large and every corners are opened to sightseers except modern area and cemetery that are closed. I really had a good time in the monastery café for its surprisingly nice desserts that made by the nuns. The monastery also has Italian restaurant which I did not try. After that I walked around the city center and saw its impressive central square, Plaza de Armas. Arequipa Cathedral at the heart of the city and located next to the square is really lovely to see for its white neo-renaissance design, although its interior is a bit disappointing, the exterior is quite unique as I rarely seen such architectural style in the old Spanish colonial city center. The cathedral also has two lovely arches and two towers, making this building more interesting. The buildings surrounded the square are also nice with two stories portico which from second floor offer really nice view of the city and volcano nearby. I also found that there are many nice churches and buildings that have really nice stone Andean Baroque craving façade around the city, the one at Church of La Campania is quite astonishing. Not only nice architecture, I also like food in Arequipa. The city is famous for its Arequipan Cuisine, and I really enjoyed its delicious Rocoto Relleno, a stuff chilli. Visiting Arequipa reminded me the city of Puebla in Mexico, both cities have lovely architecture and great food while located next to volcano! All in all, Arequipa may not offer anything really special or stand out among many Spanish colonial towns in the World Heritage list, in my opinion this city turned out to be a rewarding place to visit in Peru and should not be left for anybody who come this country. 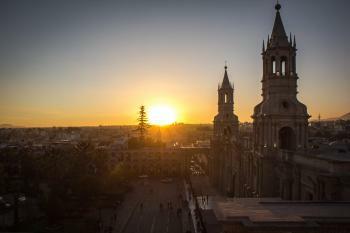 I didn't know much about Arequipa before going to Peru - even though it's the country's second largest city. In the end, it was a really pleasant surprise. I loved the feel of the place - the historic centre was very relaxed and had a welcoming atmosphere for visitors. The old buildings felt authentic and well integrated into their modern uses. The scenery around Arequipa is stunning too and it's so nice to have the mountains on the horizon. Although obviously not related to the WHS listing, I would add that Arequipa is a great base to do some trips into the natural surroundings - Colca Canyon and so on, and definitely worth a stay in the region for a little while. A beautiful colonial city and an ideal place to spend a day acclimatizing to altitude. Don't miss either the main square or the Santa Catalina Convent both of which are stunning. As an aside I dinned in an Argentinian restraunt here - enjoying steak, salad and 'chips of the day,' which were made from three different sorts of potato one yellow, one bight orange and one pinky mauve! 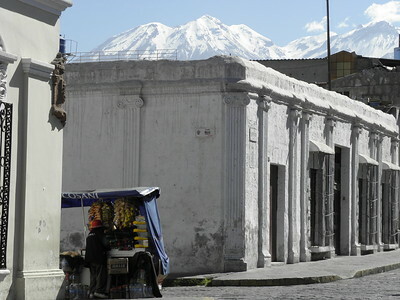 Ah, beautiful Arequipa, the colonial city surrounded by snowy volcanoes. The city has some beautiful churches and buildings with very ornate facades, there’s a nice vibe on the Plaza de Armas but the highlight of the city is the Santa Catalina Convent. Built from the white local Sillar stone, and often painted red or blue, this convent is an oasis in the busy city. It’s pretty much a small city within the city with it’s little charming streets, houses with ovens, squares with religious paintings and staircases. The entrance fee is quite steep (you can easily buy two meals for it) but it’s definitely a place not to be missed. If you are journeying between Lima and the Altiplano at least 1 way by land (as you really should) then a stop over in Arequipa is certainly worthwhile both to break the journey and to take in this pleasant colonial town. Its main claim to fame lies in the buildings, particularly the churches with their carved facades, built in the local white volcanic stone (photo). Its climate is very fine with mostly clear sunny days, not too hot and providing wonderful views of the surrounding volcanoes – one of which “El Misti” is the archetypal volcanic conical shape. The Santa Catalina Convent is also worth a visit. Fusion: "creative integration of European and native characteristics"
Mercedarians: La Merced Convent and Church "The Order of Mercy was expanding very rapidly and during the sixteenth century, it established convents in Trujillo (1535), Huamanga (1540), Arequipa (1540), ...."